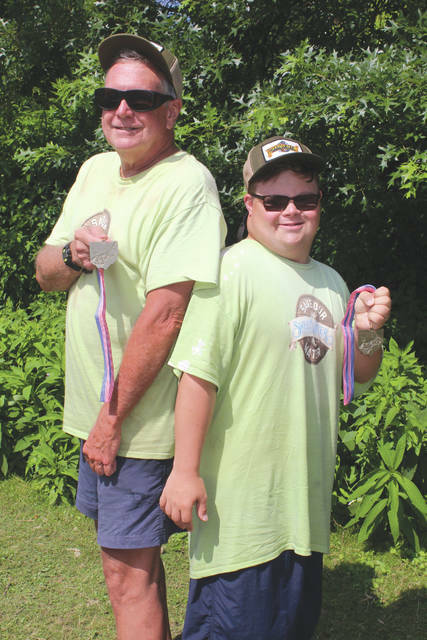 Mike Chard (left) and his son Dylan pose back-to-back with their medals in recognition of winning a state paddling title two years in a row, July 28 at the U.S. Canoe Association Ohio Championships, in Fairport Harbor. Submitted photos by Sara Fetsko. 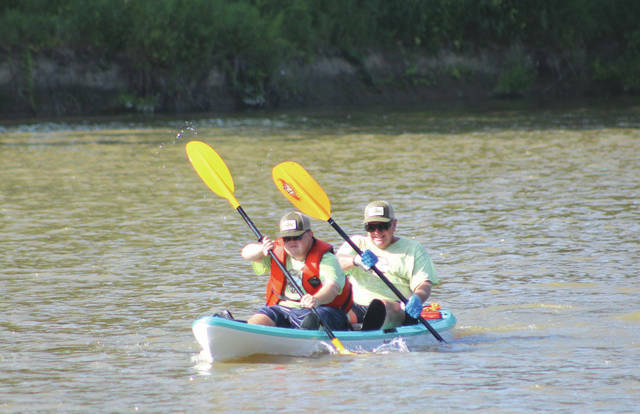 Dylan Chard (front) and his father, Mike, point to Heaven as they finish the 5.2-mile K2 Men’s Paddling competition, July 28 in Fairport Harbor. The Chards repeated as state champions at the meet. The Chards show their intensity during the U.S. Canoe Association Ohio Championships, July 28 in Fairport Harbor. At one point, Dylan Chard and his father Mike were averaging three strokes per second as they won the K2 Men’s division to repeat as state champs. BEAVERCREEK — He had so much fun winning one championship with his dad, Dylan Chard wanted to do it again. And so after long hours of training and workouts during the offseason, Dylan and his father, Mike Chard, went back to Fairport Harbor on the Grand River, and won yet again in the annual U.S. Canoe Association Ohio State Canoe and Kayak Championships. The Chard duo claimed the K-2 Men’s Recreation 5-mile canoe paddling competition in 2017. Despite high winds, the Beavercreek pair finished in a time of 1:33.58 to claim the win. This time around, the Chards used the same recreation division boat but in the K-2 Men’s Open 5-mile category. Dylan turned 21 just one week before the Ohio Championships. That changed the Chard’s entry category for the 2018 race to an all-men (21 and over) racing division. Event organizers Joe and Ann Krizman hosted the event with heavy hearts. Their daughter, Abby, had passed away just the previous month. Dylan Chard has Down Syndrome, and was hoping to meet Abby, who battled autism, at the state championship meet. As a token of their respect for the Krizman family, the Chard father and son raised their arms and pointed to Heaven as they crossed the finish line of the 5.2-mile men’s event. The Chards battled high water this time on the Grand Lake course just off the coast of Lake Erie, finishing in a time of 1:35.52. Dylan, a longtime Kettering Alter football fan and good friend of Knights coach Ed Domsitz, urged his dad to go for a repeat of a state championship ‘just like the Alter football team’ had done in 2008 and 2009. With financial backing from the Atlanta-based Sweetwater Brewing Company, along with local support from Great Miami Outfitters, the Chards set about earning the repeat. To commemorate their back-to-back feat, the Chards posed back-to-back in their Sweetwater T-shirts with their state champion gold medals. https://www.beavercreeknewscurrent.com/wp-content/uploads/sites/49/2018/08/web1_BacktoBack2_PS.jpgMike Chard (left) and his son Dylan pose back-to-back with their medals in recognition of winning a state paddling title two years in a row, July 28 at the U.S. Canoe Association Ohio Championships, in Fairport Harbor. Submitted photos by Sara Fetsko. 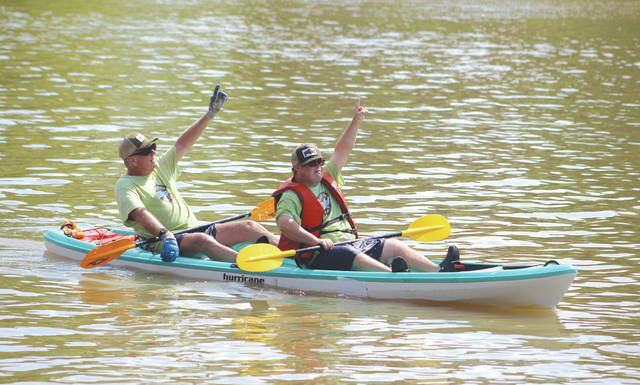 https://www.beavercreeknewscurrent.com/wp-content/uploads/sites/49/2018/08/web1_CanoeHeaven_PS.jpgDylan Chard (front) and his father, Mike, point to Heaven as they finish the 5.2-mile K2 Men’s Paddling competition, July 28 in Fairport Harbor. The Chards repeated as state champions at the meet. Submitted photos by Sara Fetsko. https://www.beavercreeknewscurrent.com/wp-content/uploads/sites/49/2018/08/web1_ForwardStroke_PS.jpgThe Chards show their intensity during the U.S. Canoe Association Ohio Championships, July 28 in Fairport Harbor. At one point, Dylan Chard and his father Mike were averaging three strokes per second as they won the K2 Men’s division to repeat as state champs. Submitted photos by Sara Fetsko.